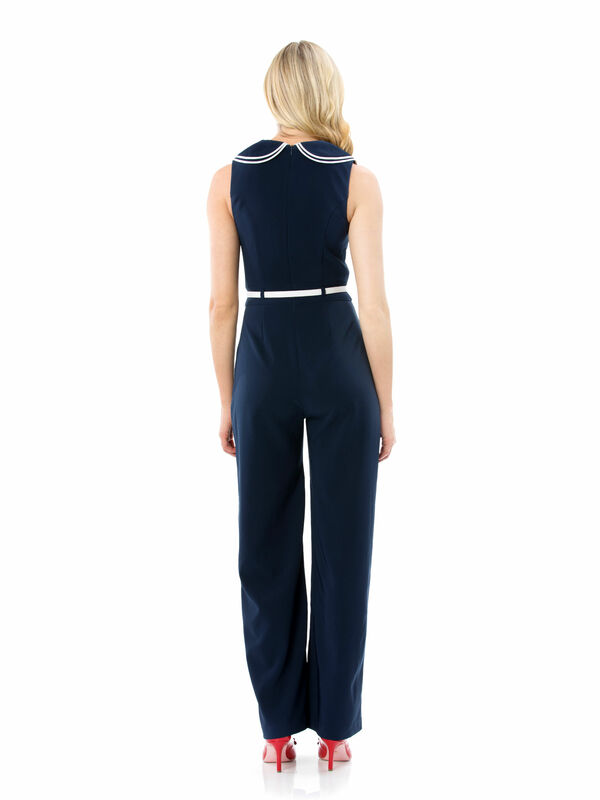 Ahoy There Jumpsuit https://www.review-australia.com/au/ahoy-there-jumpsuit-navy/RE19DR257.RENVY009.html Make a navy blue statement in the Ahoy There Jumpsuit! Playful yet stylish and sophisticated, this jumpsuit features a v-neckline, breasted button detailing and a statement white waist belt. Made from light weight fabric with a slight stretch and regular fit. Ahoy There Jumpsuit is rated 4.9 out of 5 by 27. Rated 5 out of 5 by A Review Girl from Really Different I rang Review head office to ask if ‘Ahoy There Jumpsuit’ had a zippier at all I couldn’t see one in the picture,the girl confirmed it did,so l ordered online@9am it arrived 9am next day, well it’s stunning,slimming & the fabric is light &lovely I’m already tall but l will have to take up the hems.The only thing to consider when going to the bathroom/changed is reaching the zip it runs up the centre back & is long in length & that’s a positive but l found it challenging to try reaching the zip puller handle bit itself as it’s very small to grab & then to pull all the way up or down. But as usual with Review clothing it’s true to size & stunning styles. Rated 5 out of 5 by Kimberly Jane from Stunning Jumpsuit As soon as I saw it I knew I had to purchase this gorgeous jumpsuit. The shade of blue is just perfect and the style and cut are such that you can wear it anywhere. I will definitely be getting a lot of wear. Add a jacket and it will take you into the cooler months. Sizing is Review consistent. You will need to shorten it to bring it to the perfect length for your height. I just love it. Rated 5 out of 5 by Katja from Great fit I saw a glimpse of this jumpsuit in promotional video and was hanging in there for it to be released. Ordered it online as soon as it was out as it is not available in NZ. Absolutely love it! It's quite a generous fit, I ordered my usual size 10. The fabric is great, doesn't seem to crinkle. I might get it taken up a bit, but can wear it with heels as it is. I'm 168cm tall. Rated 5 out of 5 by mariect from Fantastic jumpsuit! I bought this on recommendation from a friend and I'm so happy I did. The fabric is fantastic, and I really love the buttons and crossover neckline. The pants are a little too long for me but they can easily be altered to the correct length. I absolutely love it!! Rated 5 out of 5 by Nayamaus from Stunning A beautiful jumpsuit that flatters and is comfortable. I've always had a good experience purchasing online from Review, as it is consistent and true to size. I could wear this to work, a Fringe event (planning to), or a day out with my girls. Super happy with it. Rated 5 out of 5 by Tanya P from Looks modern , and material covers lumps and bumps Love this jumpsuit ! Got lots of compliments when I wore it ! The material has enough weight in it that it falls beautifully and cvwrs lumps and bumps . Please be aware that it is long - I’m 173cm tall and it is nearly too long for me . Rated 5 out of 5 by Livvyloo from Great fitting sassy outfit After unsuccessfully trying to locate the sailor jumpsuit in my size, i jumped online and recieved my purchase promptly. Fits perfectly and easy to use online delivery. Thanks for making it an enjoyable shopping experience.